With Spring just around the corner, students from Woodburn School District (WSD) recently gathered at the First Presbyterian Church of Woodburn to prepare their community garden for the summer harvest. Successful past harvest seasons that created more than a thousand pounds of food strengthened the community garden partnership and has launched it to a new level where even community members can participate. WSD Board of Directors Chair, Linda Johnston, started with this partnership project between the WSD and the First Presbyterian Church of Woodburn as the church’s coordinating committee member working with students and community members on the garden through out the harvest season last year. This year she is serving as the coordinator for the garden. Johnston grew up in a farm in the Woodburn area and is always ready to teach students about the harvesting process, especially when it provides more than a thousand pounds of food for the local food bank. Aside from producing food for the local food bank, students who participate in the community garden are learning what it means to give back to the community, a lesson that is incorporated into their learning at the WSD. French Prairie Middle School (FPMS) counselor, Omik Kamat, also encourages students to give back to their community and to participate in events such as the community garden. Several students from FPMS where working side by side with high school students on Saturday. “It is great to see so many of my students do community service at such a young age,” said Kamat. 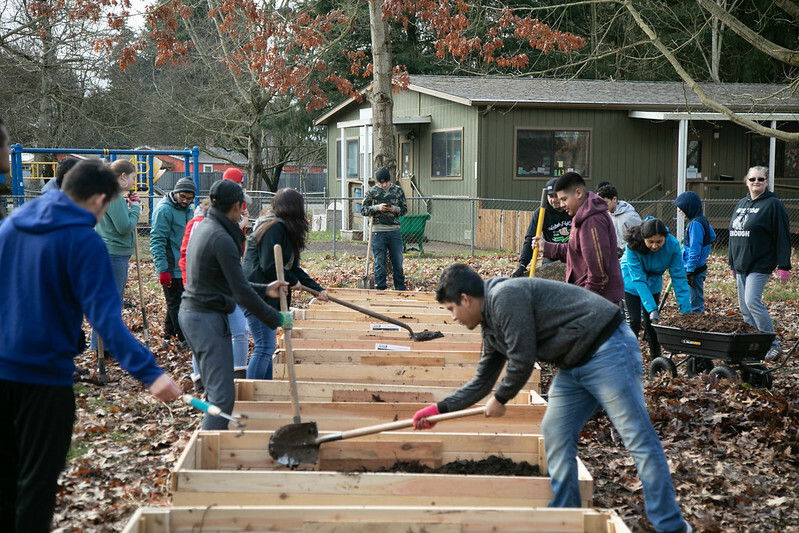 Saturday, March 9, 2019 was the first time this year students gathered at the community garden located behind the First Presbyterian Church of Woodburn at 950 Boones Ferry Rd. However, it will not be the last time this year they will be at this location maintaining the garden. It is a job that takes several afternoons and many Saturdays to complete and the community is also encouraged to participate. Rev. Cynthia J. O’Brien, First Presbyterian Church of Woodburn pastor, said that family and community members can participate in the community garden by adopting a plot to maintain. For a minimal fee of $25, not only do families get to learn about gardening, they also get to keep all the food they grow. The seeds are provided for free. Click on image to view photo gallery on Flickr.